DONEGAL fish farms are on high alert due to an invasion by millions of Atlantic jellyfish that wiped out €1.2m worth of farmed salmon six years ago. Marine biologists and the aquaculture industry are closely monitoring the arrival of the ‘Mauve Stinger’ or Pelagia noctiluca that have washed up in astonishing numbers in western counties in recent weeks. Hundreds of thousands of the glow-in-the-dark jellyfish have already been found beached from Kerry to Donegal including the Inishowen and Rossguill peninsulas. On Rosses beach, near Melmore Head, Downings, last week, stretches of sand were carpeted with hundreds of thousands of jellyfish ranging in size from a euro coin to over 15cm in diameter. 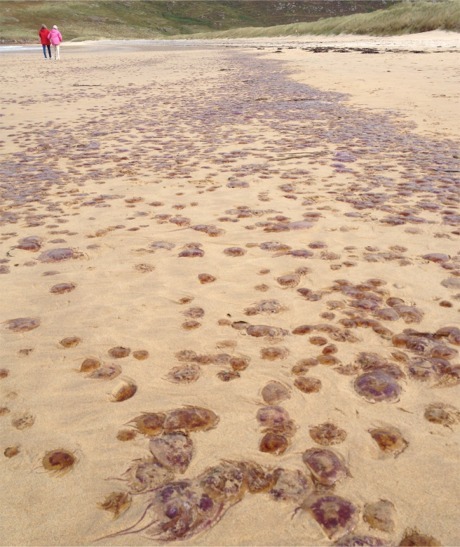 Vast numbers of jellyfish have also been stranded at Culdaff. Some of the hundreds of thousands of ‘Mauve Stinger’ jellyfish that recently washed up at Rosses Strand near Melmore Head, Downings. The Pelagia noctiluca inflicts painful stings that can scar. Jellyfish expert Dr Tom Doyle said fish farms were aware of the danger and are trying to protect their stocks from attack. He said the jellyfish were less of a threat to wild fish stocks which have the freedom to move out of their path. “The past couple of years have been very quiet in relation to the ‘Mauve Stinger’ but they have been particularly abundant this year and we have been getting lots of sightings since August,” said Dr Doyle of the Coastal and Marine Research Centre in Cobh, Co Cork. He said the presence of them in enormous blooms had previously closed Mediterranean beaches. He urged late-season swimmers, surfers and beachgoers to exercise caution and warned people not to touch any jellyfish washed up on the beach. “If you end up swimming through thousands of these, you are going to get badly stung. And they can still sting you if they washed up recently onto the beach so they should not be touched,” he added. He said it was unclear why so many of the jellyfish are becoming stranded adding that it is likely they are simply “caught out” in a high tide or strong current. Fanad-based Marine Harvest Ireland said it was closely monitoring jellyfish activity at its fish farm sites along the western seaboard. 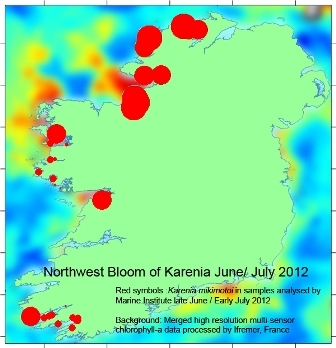 The company said it had noticed a significant increase in jellyfish numbers in Irish waters in recent years.